“You want one single item of proof that America is a Christian nation and not a Jewish nation and not an Islamic nation? One single bit of proof is all you need: we freely allow restaurants and grocery stores to sell and to serve bacon. That can only happen in a Christian country. 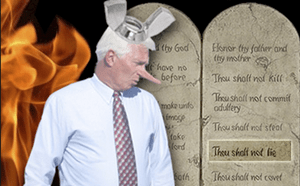 So the sheer fact that we freely allow the sale and consumption of bacon is absolute proof that we are, in fact, a Christian nation.” – American Family Association hate group radio host and spokedouche du jour Bryan Fischer, babbling on his radio show. I assumed that Bryan secretly loved sausage, not bacon. But I digress. Atlanta Police Officers Call Gay Bar Patrons “Sweetie” and “Princess”. SURPRISE! Pepper Spraying Cop At Occupy UC Davis Also A HOMOPHOBE!